Our educational partners ACM have today unveiled a new and exciting new partnership with the famed Metropolis studios. 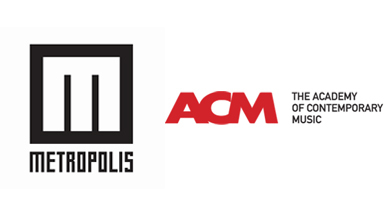 The news follows the recent acquisition of ACM by co-owner of Metropolis Kainne Clements. The new partnership will enable students to forge even stronger links between their course, the music industry and Metropolis studio – the world-famous and renowned studio creatively treats on 50% of the UK Top 40. Press Release: Students at The Academy of Contemporary Music are to benefit from a unique and extensive partnership uniting ACM and the world famous Metropolis recording studios. The partnership – unparalleled in contemporary music education – follows ACM’s recent acquisition by entrepreneur Kainne Clements (co-owner of Metropolis). Under this new alliance, ACM students will forge even stronger links between their course, the music industry, and Metropolis as a whole: the world-famous West London recording studios, which creatively treats on average 50% of the UK Top 40 charts. Metropolis also operates a Grammy-nominated record label, responsible for the Christmas 2012 number 1 single, and is home to a team of Grammy-winning mastering engineers, a video Production Company and a Creative Services division. Building upon the strengths of each business, ACM and Metropolis aim to nurture both new and established talent, ranging from students to industry-professionals. A series of plans are afoot and will be announced later this year, which will build on the newfound synergy between ACM and Metropolis. ACM students will be able to do everything from showcasing or producing music at the West London Studios to work-based learning accreditations and apprenticeships. Metropolis, meanwhile, will tap into ACM’s bespoke training for established industry staff, and collaborate with the school on a range of masterclasses, songwriting camps and A&R courses.